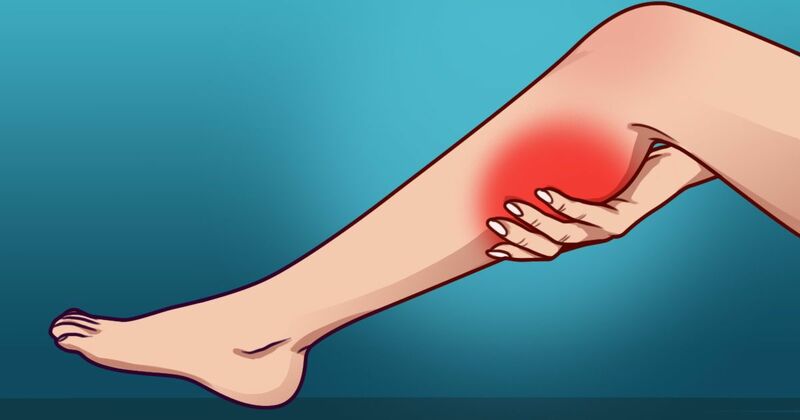 Leg cramps can be a massive pain. Here's how to treat them in the dead of night and how to prevent them from disrupting your sleep. 1. Stretch your calf muscles. Keep a rolled towel on your bedside table to alleviate pain whenever a cramp strikes. WebMD says to sit up in bed and straighten the leg. Place the rolled towel around the ball of the foot and use it to gently pull the foot back. If you do this while keeping the knee straight, the cramp should gradually release. 2. Ride a bike. The motion of riding a bike is a fantastic preventative against cramps. WebMD says it works because the exercise conditions and stretches the muscles. If you are unable to ride outdoors, hop on a stationary bike at your local gym. 3. Drink until you pee clear. Leg cramps are often linked to dehydration and imbalances in electrolytes, says Cleveland Clinic. To prevent nighttime cramps, drink a minimum of six to eight classes of water daily. 4. Loosen sheets at your feet. Cleveland Clinic recommends keeping sheets and blankets loose around the feet. This ensures toes are not mangled in uncomfortable cramp-causing positions. 5. Stretch while standing. In a conversation with the staff from Medical Edge from Mayo Clinic, The Chicago Tribune reports a standing stretch is among the best methods for alleviating calf cramps. Shift your weight to the affected leg and slightly bend the knee. This can be uncomfortable. If the pain becomes unbearable, stop and try to stretch while sitting. 6. Stretch for 3 minutes before bed. Men's Health Magazine cites a 2012 study that found just 3 minutes of pre-slumber leg stretching resulted in less severe spasms during the night. 7. Take these vitamins. Potassium and magnesium can work wonders in the fight against cramps. Doctor's Health Press recommends a daily magnesium supplement of 300- 500 mg. It is also suggested to increase potassium through diet. Bananas are not the only potassium-rich foods. Eat grapes, apricots, oranges, and cabbage for variety. Help a friend when you SHARE this article on social media!